Do You Know What These Numbers Mean on Train Coaches? 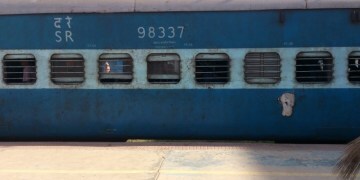 Railways are one of the most preferred types of transportation by people in India, which sometimes makes the only way to get to some areas, especially when it comes to traveling to the countryside. Trains can cover great distances and serve to connect almost all corners of the country. More than 23 million individuals utilize trains to travel from one place to another on a regular basis. In any case, not many people know the actual significance of the 5-6 digit number which is written on the outside of the train compartments/coach. Every train in India has this sort of number inscribed on its coaches. These are generally 4,5 or 6 digit number out of which the first 2 digits signify the year of production. For example, if the number is 8439, it means the train was manufactured in 1984 similarly if it’s 04052, then it was manufactured in 2004 and so on. But there are certain trains which don’t follow the above nomenclature, especially the Rajdhani express with the number 2951/2. Also, the WCR, EF and NF mean that the train is manufactured by Central Railway, East Railways and North Railways respectively.